This 27-bed unit, like hundreds of others across the commonwealth, has become ground zero in a statewide debate. On Nov. 6, Massachusetts voters will decide whether the number of patients a nurse can care for should be regulated by law. Pignone works in a unit that is already at or close to the proposed nurse-to-patient ratios, and she helps determine that. When Pignone arrives, she picks up her assignments for the day, finds a spare computer, and logs into a system called Quadramed. Pignone classifies each patient based on the number of times she’ll take their vital signs, the number of drains they have, whether they have catheters and whether they have emotional needs. And the more time they need with a nurse. Not all hospitals in Massachusetts use a patient acuity tool right now, but they would all be required to if Question 1 passes. At Mass General, Pignone will click another button during her shift if a patient needs to be watched constantly. She’ll unclick buttons as her patients improve. Pignone’s assignments will change along with the needs of her patients. “We do that kind of exchange every single day, I mean it’s pretty much minute-to-minute many times,” says Theresa Capodilupo, the nursing director on White 7. Capodilupo never assigns nurses on this unit more than three patients during the day. That wouldn’t have to change, since Question 1 requires one nurse for every four patients on what are known as med-surg units. But the Question 1 ratio applies 24 hours a day. Currently, night nurses on White 7 sometimes have five patients. To avoid hiring more nurses, Capodilupo says she’d have to shift nurses from day to night and some patient care as well, even though that might be disruptive. Capodilupo says to have the government tell her how to run her unit would be infuriating. But she sympathizes with nurses who are regularly assigned too many patients to handle safely. The problem, says Pignone, is the hospitals that don’t have adequate staffing. “Why isn’t the focus more on what they can do to help change that situation versus making everyone follow the same cookie-cutter solution when we don’t need that?” she says. There are no firm numbers that show how much staffing varies from one hospital to the next in Massachusetts. Judith Shindul-Rothschild, an associate professor of nursing at Boston College who supports Question 1, estimates that about a quarter of hospitals use the proposed or even better nurse-to-patient ratios, 50 percent comply with some or most, and a quarter routinely assign nurses an unsafe number of patients. Shindul-Rothschild says her assessment is based on staffing plans hospitals post to a website run by the Massachusetts Health and Hospital Association (MHA). But the MHA says those staffing plans reflect a daily average and can’t be compared to the proposed ballot question because it would require fixed staffing numbers around the clock. 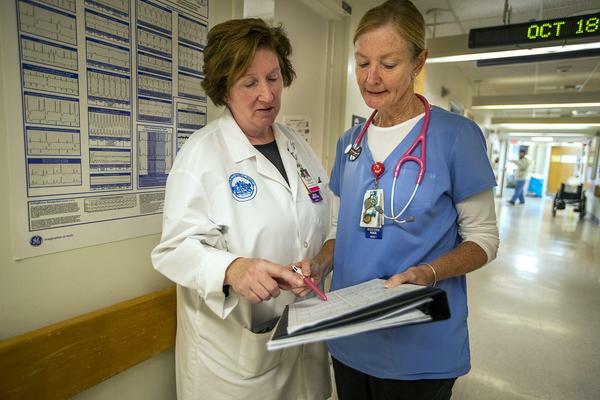 The MHA and the Massachusetts Nurses Association (MNA) have been at loggerheads when it comes to nurse staffing for at least two decades. In 2014, the two sides reached a compromise on ICU staffing levels, but nurses at many hospitals say that wasn’t enough. The MNA says members filed more than 2,000 complaints about unsafe staffing in the past year and that management refused to change the nurse’s assignment in nearly every case. Shindul-Rothschild says her research also shows wide disparities in the quality of care across Massachusetts hospitals. She suggests a connection between nurse-to-patient ratios and patient outcomes. Many studies show that adequate nursing improves patient care. But does having four post-surgery patients rather than five make a difference? California, the only state with fixed ratios, has been the test case but has not delivered definitive results. But Joanne Spetz, an author on the HPC report and a UC San Francisco professor who studies the California ratios law, says the law has delivered other benefits. During a panel discussion, Spetz told the HPC that job satisfaction among nurses has improved, that occupational injuries are down, that nursing education programs have expanded to relieve California’s perennial shortage, and that poorly staffed hospitals were forced to hire more nurses. Some hospital administrators in Massachusetts say they would have to close units such as behavioral health or close altogether if they are forced to hire all the nurses needed to comply with Question 1. Hospitals that already have more money to spend on nurses, such as Mass General, still anticipate needing an additional $34 million a year. Some nurses who helped launch Question 1 say they are frustrated by the state of the debate. And supporters say the threats of closure are a play on voters’ fears. Linda Condon, an emergency room nurse at Morton Hospital in Taunton, says nurses at all hospitals deserve the guarantee of adequate, safe staffing. Condon says she’s routinely asked to do the work of three nurses during her shift. Nurses for and against Question 1 agree that should not happen. Burke says a ‘yes’ vote would feel to her like a step backwards in the move to make nursing more professional. “I can’t imagine that this would ever happen with physicians,” she says. Burke represents one side of what appears to be a deeply divided profession and electorate, with polls showing near even splits on Question 1. So which is right? Well, it turns out they both are. 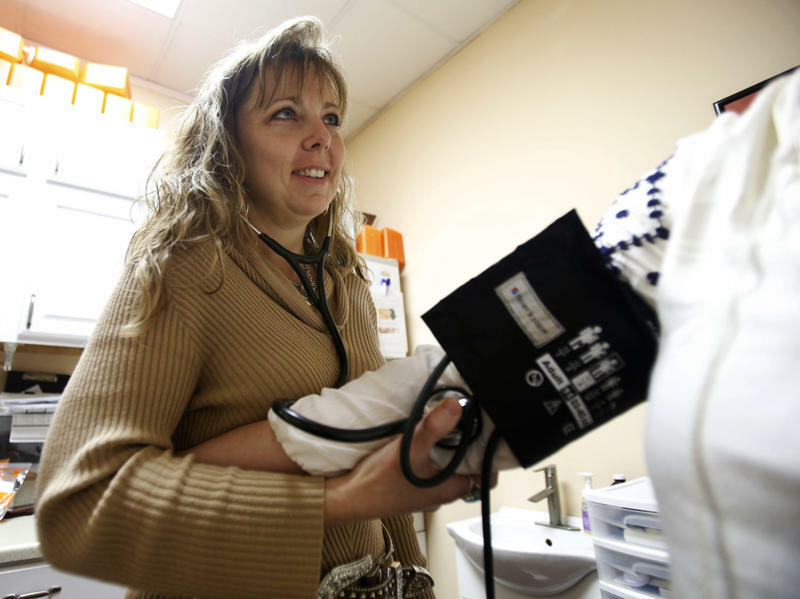 A WBUR poll of 500 registered nurses shows 48 percent plan to vote for the ballot question that would establish nurse-to-patient ratios in state law, and 45 percent say they’ll vote against the measure. Seven percent are undecided.